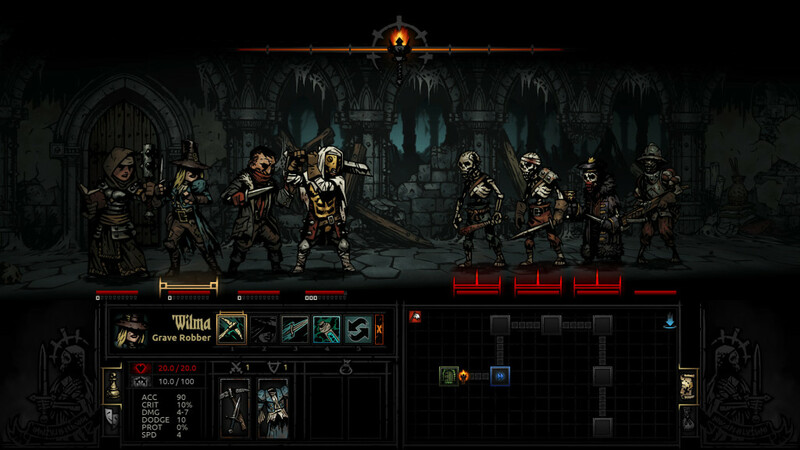 Darkest Dungeon is a side scrolling dungeon crawler rogue-like with a party management component and a unique “crow quill” art style. It walks a tightrope of challenge that not only captures the desperation of delving into the dark places that drive men mad but amidst the torment succeeds in making the experience feel just, if not kind. So often when you play a rogue-like it’s little more than a Death Simulator. You spawn at Level 1, all the enemies around you are level 10 and invariably you die on the third floor of a ninety-nine floor dungeon and the game pitilessly resets itself as if guaranteed failure due to total game imbalance were a laudable feature. Darkest Dungeon, manages to find a good balance between punishment and progression. …manages to find a good balance between punishment and progression. During my 30+ hours of gameplay I have been treated both with cruelty and with mercy. When that “Must Crit Heal” lands a +1 HP to the party I’m rattled and disheartened but when a vicious enemy’s would be coup de grâce, meant to shatter my party and set me back by hours fizzles, I am exalted. 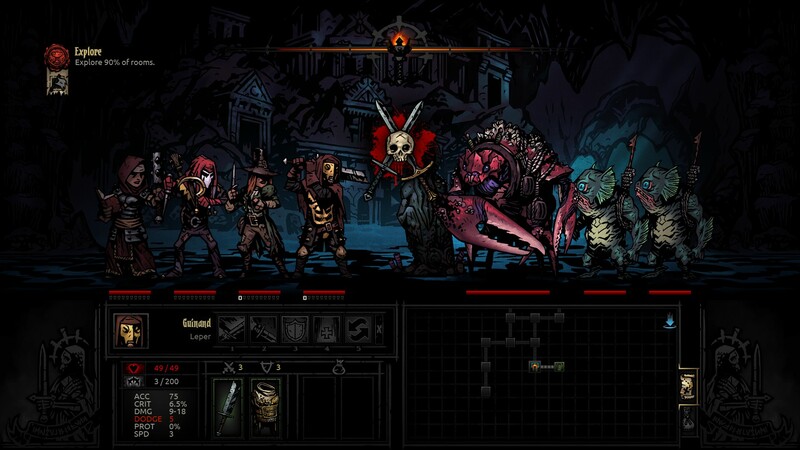 Darkest Dungeon gives you all the tools you need to survive, if not thrive. …gives you all the tools you need to survive, if not thrive. From the moment you start the game you begin to understand that you are vulnerable but not merely the play thing for undead, unholy, swine or eldritch horrors. Through tactful play and knowing when to throw in the towel on doomed adventures you can manage to slowly assemble several parties of experienced adventurers to tackle the ever more daunting challenges that the game throws at you. Darkest Dungeon follows a clever circular gameplay style. After returning to your Gothic hamlet following a dungeon run, you send your last party of adventurers (or what’s left of them) to either the tavern, chapel or sanitarium for recuperation. The stresses of an adventure have a deleterious effect on the characters and by wisely spending some of your hard earned trove on treatment for their PTSD you can assure that your investment in them does not go to waste. By sending a character off for some much needed R & R you take them out of the roster for one week (or dungeon run). Because of this, you can’t simply assemble a single powerful party of God Slayers, you need to have at least two or three more teams ready in the wings to cover your varsity team’s down time. Once you’ve upgraded gear and abilities, chose your party members and equipped them with trinkets to min/max their performance you set off to one of four themed dungeons: the undead claimed Ruins, the filthy swine monster inhabited Warrens, the fungal infested Weald or barnacle encrusted Coves, home to seaside horrors. The fifth titular dungeon will be opened near or at launch along with a mysterious new class, the Merchant. Each dungeon is composed of several interconnected passageways leading to rooms. Each passageway is broken into four segments, and each segment has a random chance of containing either nothing of consequence, a treasure, a trap or an enemy encounter. The rooms themselves act as branches or the site of significant loot or battles against enemies of increased difficulty. To be successful you must play cautiously. This means applying bandages when a player is bleeding, curing them of the Blight debuff with an Antivenom potion and of course maintaining your Torch level. As you progress through the dungeon your light source dwindles and must be refilled using torches you bought before entering the dungeon or sometimes rarely find during the run. If your Torch level dips below a certain threshold your likelihood of becoming stressed increases and the chances of surprising an enemy and gaining the opening strike dwindles. …Ultimately, your goal is to survive the dungeon and to do so frugally. Ultimately, your goal is to survive the dungeon and to do so frugally. After all emerging successfully from the foul underworld is great and all but what’s the point if you can’t make a profit doing it? If a dungeon has a reward of 3000 gold, this allows you to buy a stack of food (75 x 12), a stack of bandages (150 * 6), 3 Antivenom potions (250), two shovels (150 x 2) and a stack of torches (75 * 8) for 2950 gold total, which should be just about the right amount of supplies for a quick jaunt with minimal risk. Stress plays a major role in the mechanics of the game, simply being in the dungeon will randomly negatively influence your party members and they will accumulate “stress damage” on a meter right below their health bar. If this meter fills up the character is forced to perform a saving throw and will either gain a temporary virtue or affliction for the remainder of the dungeon, these are a randomized effects that might result in the character acting on their own, refusing your orders or boosting/decreasing their stats. Your characters also gains and loses quirks throughout the game. Quirks act as permanent buffs/debuffs which persist after the dungeon and which you must either learn to live with or treat at the sanitarium in town for a brutal cost prohibitive fee. 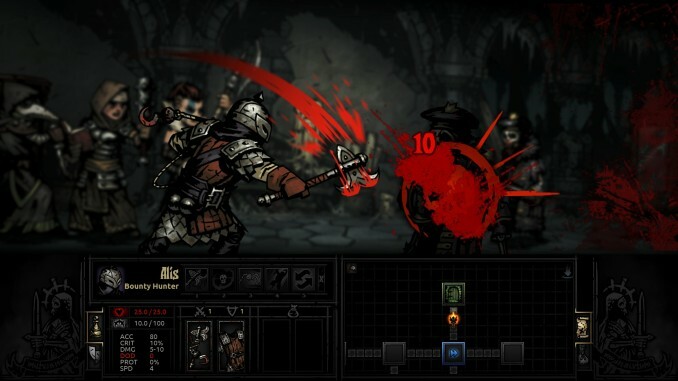 The enemy encounters are the core of this game and are what make Darkest Dungeon so engaging. The battle system is based on the position of your characters and enemies in one of four possible rows, while there is certainly room for hybrid tactics the basic formation your ranks take are as follows: the 1st row is where you place your tankiest character, the 2nd row is generally your highest DPS character, the 3rd row is kind of a wild card as it can be occupied by a second DPS with ranged or reach capabilities or a support class and the rear 4th row is almost always the healer’s position. Each character has a quick bar of four customizable abilities; each of which can only be employed while the character occupies certain rows and can only be used on against enemies in certain positions. When an enemy is defeated they leave behind a corpse which needs to be cleared out to force enemies in the row behind them forward, it appears killing an enemy with a Critical Hit bypasses the need to clean up their carcass. There are also certain abilities which clear the field of corpses, but usually at the expense of damage output. Each character class has their role in a classic “holy trinity” system of party composition and their synergy with other characters are the keys to victory or defeat. More in-depth descriptions of each of the classes can be found here, but I wanted to briefly give you my impressions of each class. The Abomination has the ability to transform into a powerful weregoat(?) with incredible melee power, however witnessing this transformation causes stress to the other party members so simply having an Abomination in your party can be risking mental collapse. This is actually my least used class because she is only truly effective in the last two rows where I tend to place a healer and a support class. Classic archer character with Arrow Rain and long range sniping capabilities. This class could be considered a half-tank as it has good survivability, but his specialty is a Scorpion inspired hook-and-chain which allows you to rearrange enemy formations to your benefit. The Bounty Hunter works well as a 2nd row fighter. The primary tank class in the game, the Crusader is the perfect front line fighter. He has a powerful singular melee attack, a two enemy hitting magic attack, a long range attack that can pull the last enemy in the enemy group forward and even a decent battle heal that can be cast on everyone except the back row. At first I overlooked the grave robber, but after I noticing that having her in the rotation tended to result in making dungeon runs a breeze I started investing more heavily in her dagger based combat which allows her great versatility in either a ranged or DPS position. The Hellion is a terrific DPS class for the 2nd or even 3rd row, as she has access to a triple enemy slicing, bleed inducing melee attack that immediately sets the tone for the battle. Unfortunately using this ability also causes a temporary debuff, fortunately this can be mitigated by casting a self buffing ability. The classic rogue class, the Highwayman is a decent ranged and melee fighter, his grape shot ability can damage multiple enemies and he has a high Crit rate with his daggers. He is a decent member for any party composition. The Hound Master is an excellent damage dealer in the 2nd or 3rd rows. He has a group Bleed abilitywhich affects all four rows and even comes equiped with a Dog Biscuit item that increases his combat effectiveness for one battle. The Hound Master is my go to DPS character except when running in the Ruins where the undead are immune to Bleed effects. The Jester is a powerful melee character but with a caveat, most of his moves cause him to alternate positions in the formation, this creates an issue for the rest of the party members because they often rely on occupying specific spaces to perform certain moves, I generally leave the Jester in town. The Leper is a perfect 2nd row character, with powerful melee abilities and even a double front row attacking ability similar to the Crusader, this character class has no particular flaws other than their refusal to work with the Abomination. The Man-at-Arms is a tank class that specializes in rallying his teammates with buffs, he’s a solid fighter but nearly as versatile as the Crusader. Personally I don’t use the Man-at-Arms much because Crusaders are a dime a dozen and have more tactics at their disposal. The occultist is a decent ranged attacker as well as a healer of either superior or terrible skill. Their healing spell can do anywhere from 0 to 10 healing which often lead to dramatic shifts in the likely outcome of a battle. 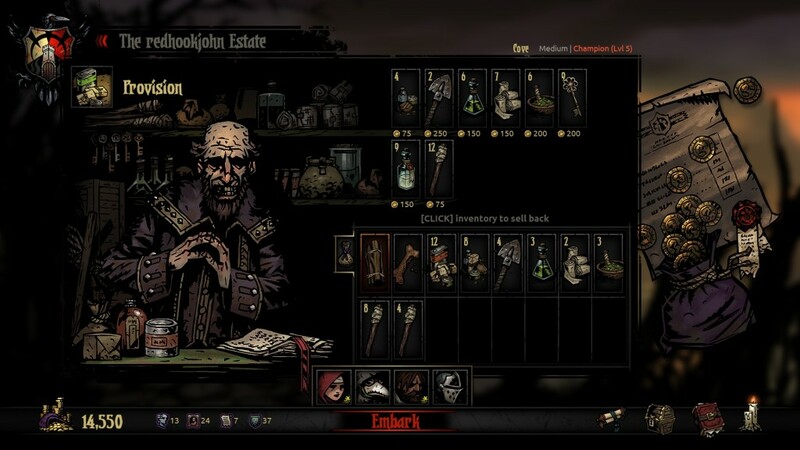 The Plague Doctor specializes in Blight based attacks, so he is useful in all locations with the exception of the Warrens where the filthy swine are immune to most of his moves. The Plague Doctor generally occupies the 3rd row where they can lob bombs, but in a pinch they have a decent 2nd row dagger attack. The primary healing class, the Vestal occupies the 4th row in most parties I take into a dungeon. She has a powerful singular heal and an effective group heal. Also on the rare occasion when your party isn’t in need of healing she has some decent range based holy attacks. 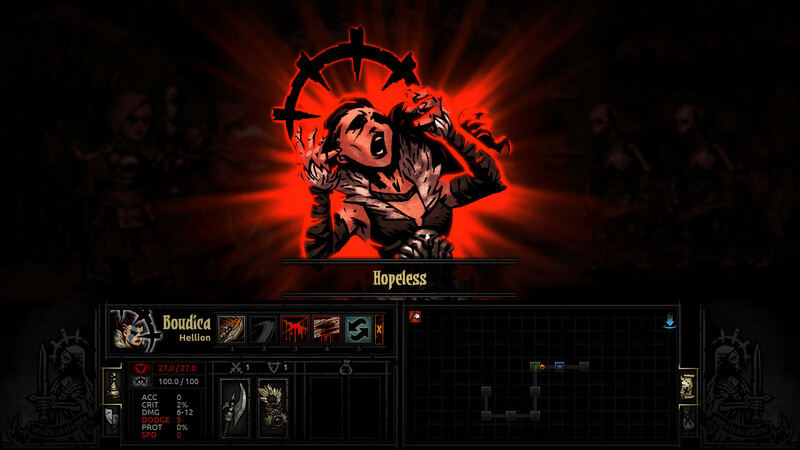 There is a lot to love about Darkest Dungeon. It Gothic atmosphere and sound design are exquisite. The commentary provided by the narrator is on par with the likes of Bastion. ( “…an indefatigable purpose.”) and the gameplay is addicting enough that you’ll find yourself saying: “Just one more dungeon” long after you should have gone to bed. It’s terrific fun to play and provides just the right amount of progression per run that you feel like your time is well spent. You grow attached to your randomly generated characters as they grow in ability and often amusingly hindering mental illnesses. Its still a rogue-like, meaning one unlucky roll can cost you dearly and if you lose a character that you’ve spent hours leveling your overall ability to progress will be greatly hindered for hours as you work to fill the sudden void in your roster.